Whether your party is searching for a lost pyramid or fighting to survive in the harsh desert sun, no Game Master wants to interrupt the adventure to draw every single sand dune and fallen obelisk. Fortunately, with Paizo Publishing’s latest Pathfinder Flip-Mat, you don’t have to! 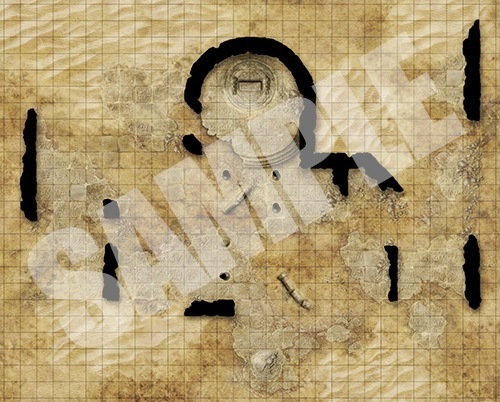 This line of gaming maps provides ready-to-use and captivatingly detailed fantasy set pieces for the busy Game Master. Whether you need a site to unearth buried secrets or battle deadly scorpions, this double-sided combat mat makes the perfect setting! Don’t waste your time sketching when you could be playing. 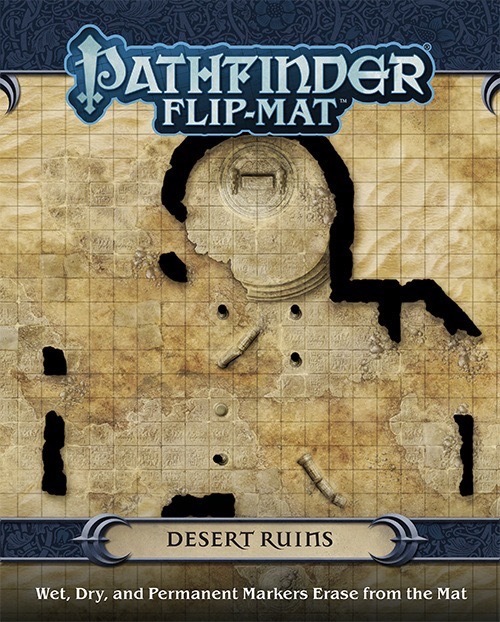 With Pathfinder Flip-Mat: Desert Ruins, you’ll be ready next time your players brave the desert sun! Will these maps appear in the mummies mask AP? Hmmm, the second image looks like the Siq approach to the Treasury in Petra (best known from the Indiana Jones and the Last Crusade). Very interesting! Oo, this looks perfect for a climactic encounter in the desert continent of Rathfell (a region in my homebrew). Looking forward to the PDF. Is this "Pathfinder Flipmat" line replacing all the GameMastery Map Packs and such? It seems like a lot of the really cool map packs from the Game Mastery line are out of print these days. It's really a shame because so many of them look awesome. Same product, just different branding. I would like to see this line more closely aligned with the adventure paths. This may be happening already. I know that Town Square was released about the same time as Rise of the Runelords Anniversary Edition and there was synergy there. Also, there was a map pack with ships that aligned with Skull and Shackles. Maybe I should clarify....I want all items in this line to be useful/used in the most current adventure path. 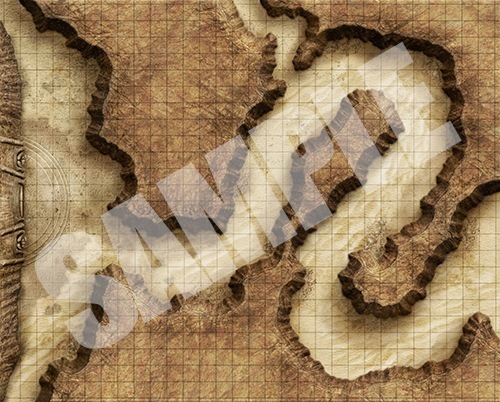 Surely, they can be used for ANY adventure people want, that is always a given, but I want to feel like getting these maps are enhancing the Adventure Paths that are currently coming out much like the Pawn collections do. We haven't had a Pawn product that wasn't attached to either an Pathfinder RPG book or Adventure Path. I would like to see the same thing done with the Maps subscription. I liked that one of the Legacy of Fire APs used the old Gamemastery Desert Flip-Mat for one of the side adventures. I'd love to see more of that sort of thing as well. What are the black segments of the Desert Ruins map supposed to represent? Shadow, walls, chasms, lack of ink, artist forgetfulness? I have no idea and just hope the black patches on the physical map do not look as weird as the digital version. Otherwise this map is for the back of the shelf...far far back! Why is it that Paizo sends out two products when you select one product when starting a subscription? Seems dishonest and that is ultimately why I have ended up with a product (Desert Ruins) that I did not want! Surely Paizo does not need to play such underhanded 'games' with their clients? Seg a subscription sometimes does that. It is not being dishonest or underhanded as you have control over your account completely. It is up to you to be proactive though and check the customer service boards for the monthly releases as well as your account to see what is shipping in YOUR subscription shipment. I do it often usually around the first of the month so I know what is going to be shipped with this month's shipments and can make sure to account for the money I will need. If you did not want the desert map was to ship after the map pack that you selected. They also ship automatically unless YOU say otherwise. So be more proactive in check what is or is not shipping and the times. Meanwhile contact customer service and you would be surprised on how they help you out. What are the black segments of the Desert Ruins map supposed to represent? Shadow, walls, chasms, lack of ink, artist forgetfulness? At first glance I thought they were shadows as well, but knowing what they are the map works well. If you don't want it, I'll take it.